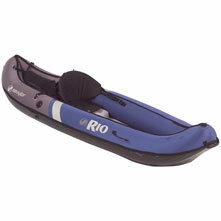 Visit Sevylor's Rio Canoe page. 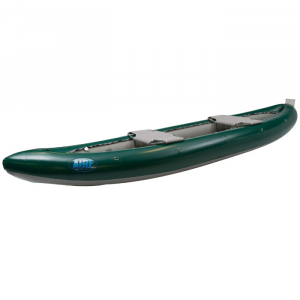 One person inflatable canoe features double hull construction for durability and rigidity. 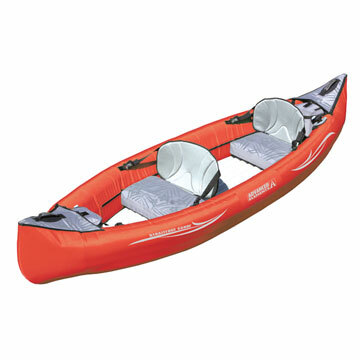 Canoe can be paddled with either canoe or kayak paddles. Suited for paddling on rivers, lakes and streams. It includes a bucket seat and a stern storage compartment. Vinyl strakes on the underside help the canoe track. It will also accept the Sevylor SBM trolling motor. 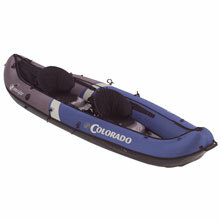 Comes with repair kit and nylon carry bag.Specs:9'7" legnth3'2" beam25 lbs.1 person capacity350 lb. maximum capacity. 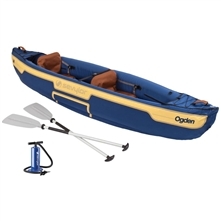 The Sevylor Rio Canoe is not available from the stores we monitor. It was last seen July 25, 2017	at SunnySports.